Attention pet owners and all animal lovers! The past is packed with tons of free greeting cards to send to your loved ones or use for your holiday crafts. 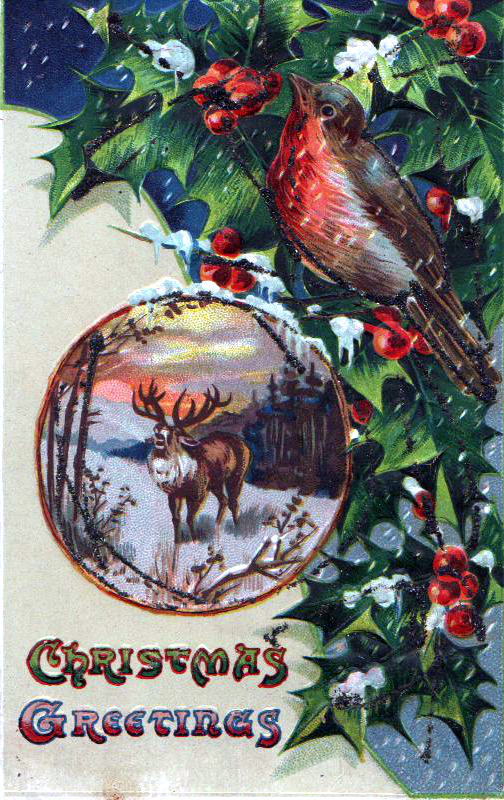 This Christmas illustration comes right from the personal Collection of freevintageillustrations.com and features two classic holiday animals, a Red Robin and reindeer. This embossed postcard also comes decorated with glitter, snow, and holly illustrations. This vintage holiday illustration dates to approximately the late 19th century to the turn of the century (early 20th-century). This antique illustration is free to use and your holiday projects. You can click here to head straight to the complete free Christmas image Library or follow on Facebook for exclusive Christmas illustration that you can’t find on the site!